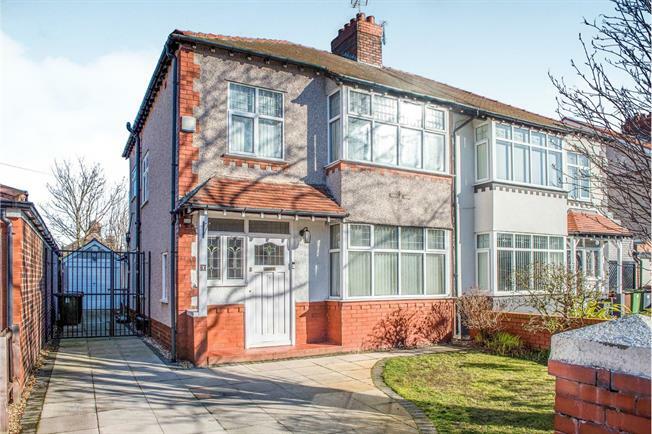 3 Bedroom Semi Detached House For Sale in Liverpool for Offers Over £280,000. Coming to the market and offered with no onward chain, Entwistle Green are pleased to present this three bedroom semi-detached property for sale. Located on the ever popular Manor Road, the house offers plenty of space internally with two large reception rooms, a kitchen with breakfast room and three good sized bedrooms upstairs. In brief, the property comprises of; Entrance hall, Living room, Dining room, Breakfast room, Kitchen, Downstairs WC. Upstairs there are three bedrooms and a family bathroom with separate toilet. Externally there are front and rear gardens, a driveway to the front and garage to the rear. Wooden door, uPVC bay window unit, ceiling light fixture, wooden flooring, wall radiator. Feature fireplace with wooden mantelpiece. Wooden door, uPVC door and window units, ceiling light fixture, wooden flooring, wall radiator. Wooden door, uPVC window unit, ceiling light fixture, wooden flooring, wall radiator. UPVC door, uPVC window unit, ceiling light fixture, tiled flooring. Wooden wall and base units, stainless steel sink with tap, built-in overn, grill and hob unit with extractor hood, wall mounted boiler. Wooden door, uPVC window units, ceiling spot lights, carpeted flooring, wall radiator, Ceramic sink with pedestal and mixer tap. Bath unit with mixer tap and shower fixture. Separate shower cubicle with wall mounted shower and glass door.